We know the laureates of the ADAMED SmartUP 2nd edition. Almost 3,500 registered applicants, 14 extraordinary scientific puzzles and 50 participants of an innovative science camp – these figures best represent the success of the 3rd edition of ADAMED SmartUP scientific programme. On 12 September, during the gala in the Copernicus Science Centre in Warsaw, this year’s ten laureates were presented. 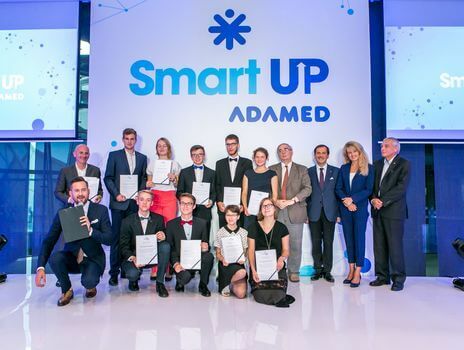 The laureates of ADAMED SmartUP will participate in an individual educational tutoring programme within which outstanding Polish and foreign experts and scientists will design and supervise individual learning curricula for each student, prepared according to the laureates’ capabilities, needs and aspirations. The awards were presented by the representatives of the Scientific Council of the Programme, and the guests included representatives of the best Polish universities, the government, as well as business and education sectors. “Ambitious and diligent, smiling and polite”, as her chemistry teacher describes her. Student of Stanisław Staszic High School No. 14 in Warsaw. Finalist of the Department of Education’s Competition in Chemistry, member of many scientific circles of interest, she also reached the second stage of the Chemistry Olympiad. She completed a traineeship in a chemical laboratory at the Warsaw University of Technology, working on the development of aciclovir. She binds her future with paediatrics. Apart from her intellectual development, she pursues her passions: sailing and travel. She also plays in a volleyball team, and in the framework of theatre classes she takes part in festivals all over the country. His biggest passions are chemistry and biology and his dream is to conduct scientific research. He comes from Brzostek in the Podkarpacie Province, and he is a student at the King Władysław Jagiełło High School No. 1 in Dębica. He spent his last summer holiday doing research work on biopolymers, attended lectures and laboratory workshops at the Rzeszów University of Technology, qualified for the Regional stage of the Ecological Knowledge Olympiad, and won first place in the District Ecology and Chemistry Competition “Human, Chemistry and Environment”. He admits he is passionate about wild forests and watching nature up close, especially in the Bieszczady Mountains. Milena realised that not only sugar and salt are “white death” and that every fully-fledged scientist has experienced at least one explosion in their lifetime when she was wondering how to get nitric acid for home-based production of nitroglycerine. She is a graduate of the Publiczne Gimnazjum nr 52 Ojców Pijarów (Piarists’ Public Middle School No. 52) in Krakow, which is also her home town, and she has been a finalist in numerous competitions, including the Małopolska Biology Competition, which she won. She says she likes unusual combinations, especially when it comes to TV shows, which would explain her love for House M.D. and The Penguins of Madagascar. She is also involved in drama classes. He comes from the small town of Micigózd in the Świętokrzyskie Voivodship and he is a graduate of Saint Hedwig the Queen High School in Kielce. Back in middle school, he was five times a laureate in provincial biology, chemistry and physics competitions. In addition, he is a finalist in the 29th Ecological Knowledge Olympiad and laureate of the 44th Biology Olympiad, in which he won a silver medal and came 11th in Poland. Apart from school activities, he participates in the “Szlachetna Paczka” (Noble Box) campaign and works as a volunteer at a Children’s Hospital and World Youth Day events. Keen on biology, chemistry and mathematics, she lives in the village of Szałsza in Śląskie Voivodship and is attending the High School with Bilingual Departments No. 3 in Zabrze. In the future she plans to study medicine and she has already begun to gain experience in this sphere: she has been volunteering in the Artificial Heart Laboratory in Zbigniew Religa’s Foundation for Cardiac Surgery Development. Laureate of Provincial Subject Competition in chemistry. As far as her free time is concerned, whenever she is not studying, she spends it in an active way: horse riding, hiking in the mountains and walking with her dog. She won Poland’s Amateurs’ Masters in Dressage in 2015. To study astronautics and to work for NASA as an engineer is his greatest dream. His project of a “modern tank” got him to the final stage of the E(x)plory Contest, which was – as he himself confirms – his greatest scientific achievement so far. He lives in Kąty Wrocławskie in the Dolnośląskie Voivodship. He graduated from Polonia Belgijska High School No. 14 in Wrocław. Besides science, he also takes care of his development in politics and economy, such as his participation in the European Youth Parliament. He is not afraid of things he does not know as he starves for knowledge and for experience. So he says about himself, born and raised in Międzychód, Wielkopolskie Voivodship, student of Grey Ursulines’ group of schools in Pniewy, where he performed the duties of the school board chairperson. A laureate of the Provincial SuperMatematyk Contest, gives free private lessons in maths, and is active in the circle of interest in chemistry. Together with his team, he took 1st place in the regional Chess Competition, qualifying to the provincial stage. He is very active in his free time, mostly swimming in the nearby lakes. A 16-year-old citizen of Gorzów Wielkopolski, this year’s graduate of Stowarzyszenie Edukacyjne Middle School in his hometown. His is a laureate of the Provincial Subject Competition in Physics and the Subject Competition in English. He took 4th place in the national contest in programing in the middle school students’ category. Apart from his development in exact science, he is also devoted to his other interests: he plays bass guitar and learns foreign languages – English, Spanish and German. A 16-year-old from Mielec, laureate in the Provincial Contest in Mathematics while in the second grade of middle school. She took 1st place in the junior category of the National Contest in Cosmic Science; she was also a finalist of the Mathematical Olympiad for Middle School Students. Her greatest dream is to work as a scientist. She was a member of the “Abrakadabra” dance group for 8 years. Laureate of the certificate “Młodzi Nieprzeciętni” (Outstanding Young) awarded yearly to talented youth by the President of Mielec. Her greatest dream is to work as a scientist and she is on the right track to fulfil this dream. The third chance to win the scholarship of your dreams! Do you want to be a part of this incredible adventure? Do you dream of a professional scientific life? The enrolment for the third edition has started on 1 September on the website: www.adamedsmartup.pl. Register and compete for this unique scholarship!